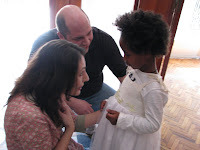 Since Yabsira has been home we have learned so much about Ethiopia and her life there. If it wasn't for our daughter we would still think that the "We are the World" pictures and videos we saw in the 80's just simply COULDN'T be happening NOW. But it is. The details of my daughter's life are her's, and her's to tell. But what I will tell is that it is common to many people, especially children in Addis Ababa, Ethiopia to live in conditions that are nothing like the ones I live in. Many do not have bathrooms, running water, electricity or even kitchens in their homes. (Over 80% of Addis Ababa is slums) Three meals a day(or even one) and a second set of clothes and shoes that you don't have to share can be a luxury. When I asked my daughter for ideas of items to bring with me for the children in Ethiopia our conversation went like this. "So, Yab. Before you went to the Orphanage, if there was one thing you could have that you didn't have what would it be?" She stopped playing with her happy meal toy and looked right in my eyes. Whoa, once again a response I wasn't expecting. I felt tears well up in my eyes. Out of all the things in the world that she could have said the thing that was most important was a Mommy and Daddy. 16.2 million children are orphans in this world. Think about what that means, really think about. If you are a parent start thinking about what you do for your child. Hugs and kisses, reading stories, tucking them in bed at night, being there if they have a bad dream, feeding them, disciplining them the list could go on and on. If you are a child(and we all are)think about what a Mommy and Daddy is. Someone who loves you even if you throw up on them. Someone who lays in bed with you at night listening to all of life's tough questions and the silly ones too.Loving and being loved. The smell of your mother as she puts her arms around you in a hug. You feel relaxed and safe. But 16.2 million children grow up with out that kind of love. So, what can we do? God has called us all to take care of the orphans and widows but not all the same way. To some He says,"This orphan is no longer an orphan, she is your daughter." To others He says take care of my children by sponsoring a child in Sierra Leone to go to school,have clothes and a meal. And to others He says, "GO!" be my hands and feet in Haiti, love on my little ones. The women of my church are collecting underwear, the Jr. highers, toothbrushes. Nothing is too small or too big. You would not even imagine how something as small as a toothbrush can make such a big difference in the life of a child. For others they are donating directly to Children's Hope chest for our specific trip to meet the immediate needs of the children and Care Centers and Orphanages we will be visiting. If you would like to do this please go to http://www.hopechest.org/ and click on GIVE and please put "Ethiopia Vision Trip" in the notes section to make a tax deductible donation. Our team leaves in just over a month to answer the call that God has given us. Could you please pray for us so that we may be HIS hands and feet to all that we meet in Ethiopia. Yabsira has been in love with the fall! The cool weather, the fire pit, pumpkins, "wollyworms", and especially the trees with their bright beautiful colors. This morning before church we looked out the window and saw the leaves falling off the trees and I made the statement that after lunch we could jump in the leaves. Yabby made a squely girly noise. It is so much fun because things like this are firsts for Yabsira. And what is really fun is that her firsts she can express with the words of a six year old not a small child that doesn't have the vocabulary yet. So I was wondering what she thought jumping in the leaves was. "Mommy, Do we climb in the branches and jump?" "No, we rake them into a big pile and jump in them." "I'll show you after lunch." After lunch came. And just like sled riding she got the hang of it quick. After a while she decided the pile of leaves wasn't big enough and made it her mission to hand pick every leave off the tree. She would be still out there working on it now if we didn't spot her new pet, a cute fuzzy wollyworm. The whole afternoon she had the biggest smile on her face and she kept saying "Mommy, this is the best day ever!" Today my buddy turns 10! Our son has been gifted with the ability to love more, laugh more, notice more then anyone I know. So many times we cannot believe God trusted us with such a blessing!